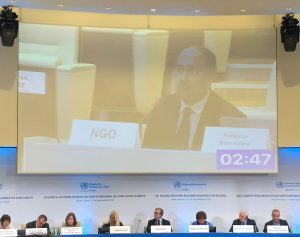 On Thursday, 20 September 2018, Knowledge Ecology International (KEI) delivered the following statement in Rome during discussions at the WHO Regional Committee for Europe on the WHO Roadmap on Access to Medicines and Vaccines. Universal health coverage serves as the overarching theme that underpins the vision for the WHO’s roadmap on access to medicines and vaccines. A roadmap with robust language on transparency would reinforce the WHO’s authority to explore norms and mechanisms to enhance the transparency of R&D costs, prices and revenues. The lack of transparency currently impedes or delays many of the policies that would otherwise be available as policy measures to reduce the price of medicines and vaccines. In particular, without reliable information regarding the costs of R&D, the costs and results of clinical trials, private sector expenditure on the development of products, expenditures on marketing and revenues, it is hard to design alternative policy measures to reduce the current prices. On excessive pricing, we request the WHO secretariat to develop a best practices manual on the subject of the control of and remedies for excessive pricing by December 2020. The manual should compile expertise on various legal and technical aspects of excessive pricing, including the context specific methodologies employed by Member States for determining if prices are excessive, and the mechanisms to remedy and control pricing abuses. With respect to the overarching theme of achieving universal health coverage, access will always be constrained and unequal without the delinkage of R&D costs from the prices of drugs, vaccines and other health technologies. On biologic drug competition, we request the WHO to consider new policies and guidelines that can enhance competition for biologic drugs, including greater transparency of know-how and access to materials in order to create highly competitive markets for biologic drugs. Finally, we request the Secretariat to produce a report on potential intellectual property and regulatory barriers for gene and cell-based therapies including but not limited to CAR T and CRISPR.